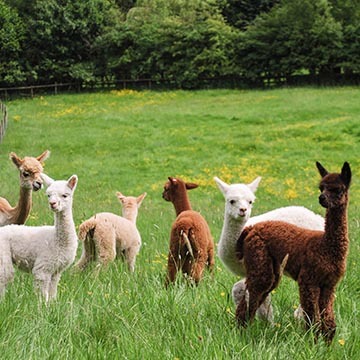 Once you have decided to take on the challenge of breeding alpacas you realise quite quickly that you have entered a world in which there are many variables and a potential for improvement that is vast. Indeed one of the delights of breeding alpacas is that you rise to the challenge of improving your herd year on year always seeking the genetics that may accelerate what is a very slow process. The one thing you quickly realise is the more you find out the less you know. Each breeder you talk to will have a different theory, have made different choices based on that particular theory and the results will vary depending on the soundness of that first decision. The facts are that breeding alpacas for improvement is a slow process. You invest money in selecting a male for your female and wait a full year for the cria to arrive. Even when it is on the ground and bouncing around your paddock you will not know if you have made a great improvement until the cria matures. With only one cria per year, two years for a female to reach fertility, three years for a male to reach fertility, you have a long wait before the results of your breeding decisions come to fruition. To move on from that first decision the cycle begins again. It isn’t rocket science to work out that breeding alpacas is a long continuous process of monitoring, selecting, studying but most of all waiting. Given that the majority of alpacas which are imported to this country from South America have 500 years of mixed genetics in their makeup there are a lot of variables inherent in any breeding choice. What we are all looking for is a way to identify the basic genetics of our alpacas and get some kind of consistency in our results. 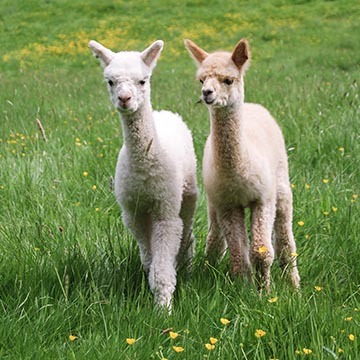 We want our alpacas to be alpacas and to exhibit no Llama or vicuna traits. We want our huacayas to breed huacaya and Suri to breed Suri. 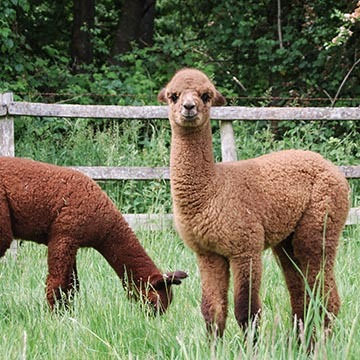 We want our animals to be colour consistent and breed alpacas of solid colours. We want white to breed white and black to breed black if we are to have any control of the amount of fleece we produce in each colour bracket. Then on top of all these basic improvements we want to improve the fleece. We want fine, dense alpacas which are crimped to the topknot, with a beautiful handle and sheen with a cutting weight of 6kgs. We are not asking a lot, are we? The question is; will we live long enough to achieve this? We want to know that when we pay a considerable sum for a female that she has a pedigree that ensures that the cria will fulfill our expectations. Given the history of alpaca development in South America an absolute pedigree is pure fantasy. There will always be throwbacks there will always be anomalies, for the better and for worse. Given that it’s taken 500 years to mix up the alpaca genetics and reduce the potential of the animal by 50% of what it was in pre Conquest times it will take an awful lot of generations to get an absolute pedigree established. All we can hope for is to judge our animals well, understand the sort of improvement we seek, and activate the process that will move us forward from where we are now in a search for the consistency that will start to make breeding and improving alpacas a science and not a lottery. Some people have the resources to chase the top males and will search for them on, price, hype, show medals, statistics, look or whatever their criteria dictates. Sometimes their investment will bear fruit and sometimes it will add another set of variables into what is already a random situation. There are a whole host of reasons for an owner making a breeding decision. This is their choice and is one of the joys of owning alpacas, you are your own boss, you makes your choice and you live with the decisions. Given that alpacas in the UK will live 15-20 years you will be living with those decisions a long time. The difference between the unimproved and improved alpaca is widening every year as breeders apply genetic selection to their herds. It is vital that we take on board that we must improve our alpacas. To merely breed numbers of the same standard is to be left with a field full of animals that are decreasing in price with each year that passes as the standards move forward leaving behind a lot of loveable animals that nobody wants to buy. The factors that ring true are that if we breed our females to males exhibiting better traits than the females then we will, given a bit of luck , have made some improvement. If we breed our females to males with proven offspring on the ground we will have more of a chance of improvement. If we breed our females to a male with a lineage that is identifiable and fairly consistent then we improve our chances of improvement. As long as each year we are breeding to improve we are breeding responsibly. Once we have achieved some consistency in the breeding of our herd the hard work starts. Then we must move on to assessing the herd as a whole and the traits of the individual animals. We will be searching for the individual traits in each male that will complement and improve our chosen female. When we are selecting traits from a standard of similar males the breeding of alpacas starts to become a science rather than a random punt with our hard -earned cash. Given the slowness of the process there’s a lot of time to study and learn as we wait to see our animals mature. At TOFT Alpacas we have decided to give ourselves a jump-start in the search for consistency by breeding into the sixty years of selection already pioneered by the Accoyo herd of Don Julio Barreda. Don Julio is one of if not the most respected breeder of alpacas in Peru and his Accoyo animals have formed the foundation stock of many of the herds of excellence in South America and across the world. He has devoted his life to the improvement of the alpaca we can think of no better starting place than breeding the Accoyo genetics into our herd. The results of four years of breeding to the Accoyo bloodlines so far have been very rewarding and set a standard to work for in our future breeding decisions.